Sole… “False” sole, shedding sole, retained sole. When to trim? When to leave it alone? Sole... "False" sole, shedding sole, retained sole. When to trim? When to leave it alone? Tis the Season For Thrush! Linda Winfield Cowles on Join the Whole Horse Health Yahoo Group! Stephanie Cahoon on Sole… “False” sole, shedding sole, retained sole. When to trim? When to leave it alone? Dolores Cobb Phifer on Join the Whole Horse Health Yahoo Group! Gianmarco Fabbri on Sole… “False” sole, shedding sole, retained sole. When to trim? When to leave it alone? I’m writing this article on different types of sole and how to manage it because its a confusing topic to understand. Its important to be able to assess the state of the sole as an owner, and all trimmers need to be knowledgeable about assessing sole durability and depth. 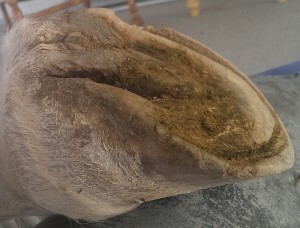 There are characteristics that help us assess this, but if the horse has active laminitis, our assessments become crude guesses because the coffin bone location could change. Sound bare feet are a product of an appropriate diet and are shaped by abundant exercise and the movement patterns of the body they carry. If the body is balanced, the feet are generally symmetrical. If the body has pathology, the feet mirror it. Regardless of where they live, healthy, sound bare feet have several things in common. When barefoot horses are optimally sound they have a supportive frog, thick durable sole and a low ridge of wall and heel beyond the white line/live sole junction. How much wall is adequate is variable, it depends on the horse and environment. Some horses accumulate a very thick sole and don’t appear to “want” this lip of wall, but in some feet, that thick sole is an over accumulation. We need to rely on the horse to tell us what works for them and what doesn’t. DON’T rely on just lip licking and sighing!! I have witnessed horses undergoing an invasive trim licking their lips, snorting and sighing, and then walking off VERY sore. They are sometimes licking as a sign that the trim is relieving discomfort, but they are sometimes doing it because the trimming is uncomfortable and makes them anxious, much as being in the dentists chair makes us anxious, and they want to encourage us to end it. The trims I admire and have seen work great look like the trims below. Most of these trims are “transitions”, feet in the first year after having shoes removed. The September trim below has a very low rim of wall, but for this arena horse it is what works best. 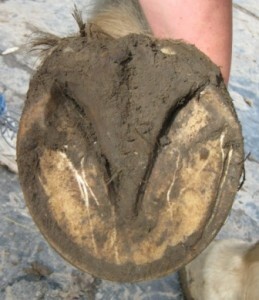 This horse works in a soft sand arena and is booted for trail work. The hoof below is before a 5 week winter trim, and the trim at this level will change the foot very little… most of the wall is shaped by the upper bevel, the bars will be neatened slightly and the lower edge rolled. The wall is beveled or rolled when trimming so that the edge of the wall wears predictably over a 5 or 6 week cycle and is almost as long at 5 or 6 weeks as it was after trimming. These subtle bevels and rolls allow a skilled trimmer to compensate for imbalance in movement so that the pre-trimmed hoof is still fairly balanced and the boots still fit. There are differences in feet from swampy wet areas and hot, arid areas, and the differences are usually accumulating sole and frog. In wet areas, the sole and frog exfoliate easily, and in arid climates, they became a thick, tough horn that resists wear. These different characteristics have advantages and disadvantages. The Virginia hooves below are easy to trim because they are softer and landmarks are clear and specific. The feet have a good sole and adequate heel, wall and bar for traction, and the frog is lush, wide and open. 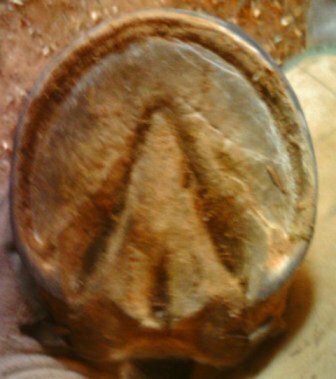 BUT this hoof can be tender on hard gravel surface, and because the horn (calloused parts of the sole and frog) is softer, it wears faster. 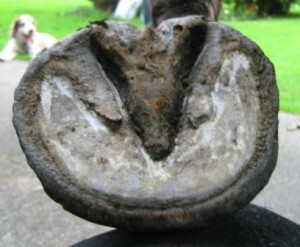 The Nevada hoof below has a thick, hard sole, but its more difficult to see the sole depth. Its durable and tough. The Nevada hoof below, in contrast, has an over accumulation of bar and sole. Not only is it hard to tell what needs to be trimmed, its physically VERY difficult to trim… these feet are like granite. 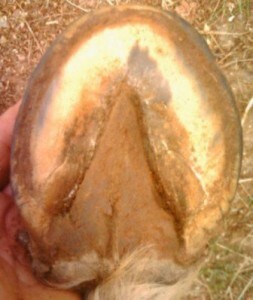 The Belgian hoof above, is shaped by a slick winter paddock. The slightly prominent bars have a natural function, they provide traction in the slippery environment. If the walls are trimmed regularly, the bars self maintain at this length. When the walls are allowed to get excessively tall, the bar also accumulates and must be trimmed when the wall is trimmed. A well beveled wall wears at about the same rate it grows at and this balanced wear should allow the bar to wear at the same rate. 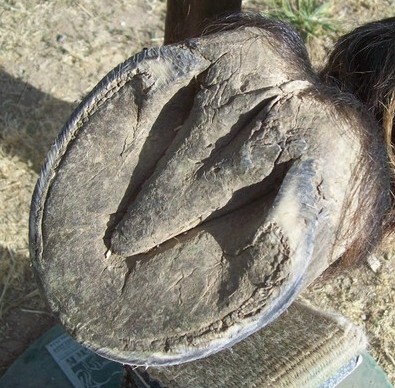 The hoof from the Northern California trail horse below is shaped by hundreds of miles ridden bare on lava rock and hard packed trails. 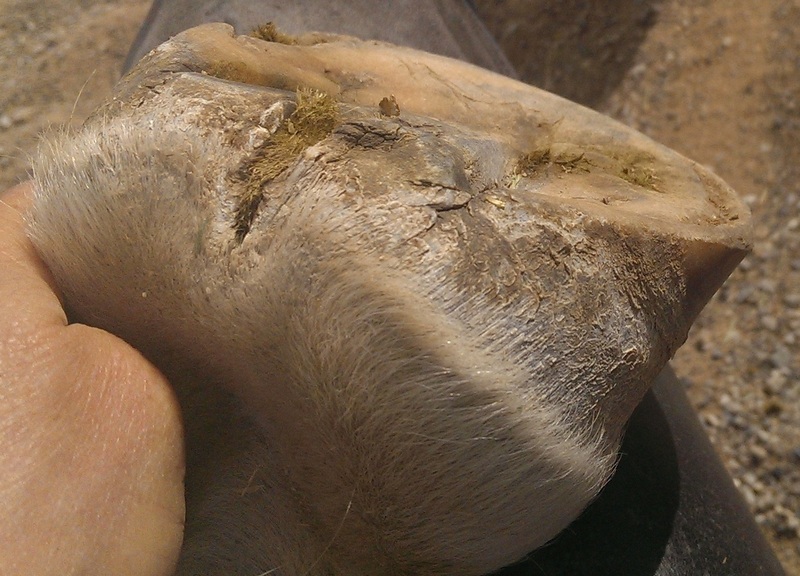 The heel is trimmed to be well above the sole to make the horse more comfortable going over gravel, to reduce sole abrasion and to add to traction. 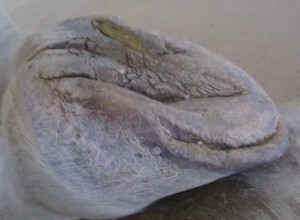 Untrimmed, this hoof looks very similar at 6 weeks to what it looks here. It was prettied up for pictures but belongs to a professional trimmer who merely touches it up occasionally. So you’ve seen some conservative trims, above. Lets look at the opposite. “Invasive Trimming” is a judgement call because trimming that is invasive on one foot may be necessary on another. Most trimming approaches taught in the US are conservative, but unfortunately one popular approach is invasive and is being taught to beginners who don’t have the experience to know when to stop trimming. This is probably invasive for barefoot in most dry areas, including mine, and probably okay for shod feet is the wall edge was rasped down. It may be fine as in in boots or on a very soft damp footing. Callous has been removed but the sole still looks fairly thick. “Invasive” procedures involve cutting into the passive (not weight bearing) bar, removing protective sole, taking the heels down to the live sole plane and shortening the wall in a way that leaves the sole over exposed to wear. Sometimes rehab feet need what could be, for some feet, considered an “invasive” procedure, such as trimming an accumulation of bar. A routine shoeing trim is technically invasive if your intent is to leave the sole unprotected by a shoe or glue on appliance. So what to trim or not trim if you aren’t sure? Less is more in most cases. If you don’t know and aren’t a professional with a lot of experience, get advice from a conservative trimmer or farrier, or join a conservative trim group like PHCP http://www.pacifichoofcare.org/. Most importantly, carefully observe the horse before and after the trim and have your objective be a more comfortable, balanced and relaxed stride. The horse will always tell you, you need to listen. My rule now is that, ideally, the horse should be MORE comfortable after the trim than before, or at least as comfortable. If the horse is sore / more sore, the trim could be the reason. Not always, though! HINT: If there is a large group of people attacking your trimming guru as being invasive, try to get a second opinion on their approach from another organization! I’m closely aligned with AHA and PHCP but have a lot of respect for trims taught by many other groups. There are many ways to learn, choose a method that focuses on your horses health and comfort. Beginning trimmers shouldn’t be doing anything that is invasive. 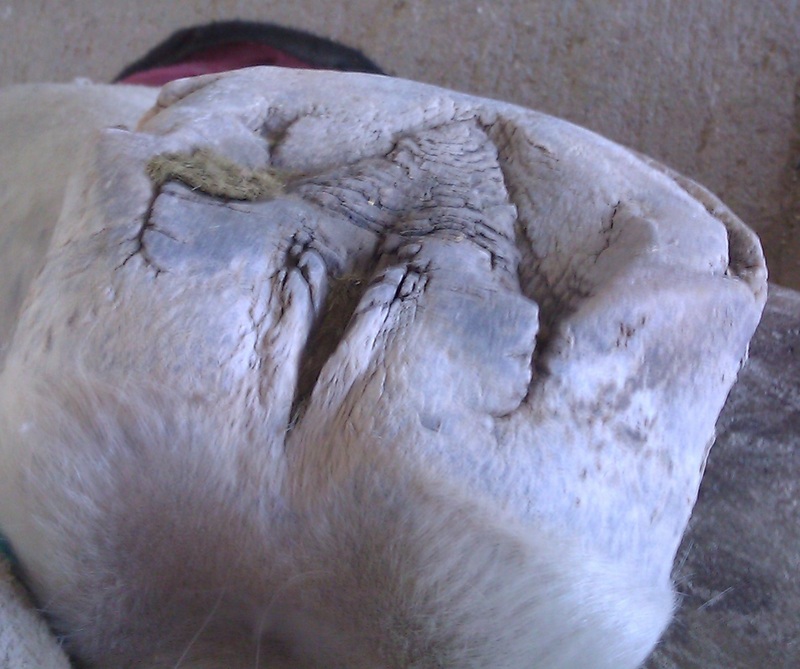 I learned from an invasive trimming school that taught hoof mapping; unhealthy feet were over-trimmed to look like what the trainers felt the “healthy” hoof should look like. These horses were uncomfortable, and I was told that discomfort was part of healing and was natural. I started learning from Pete Ramey, and never looked back as I learned that “transitioning to barefoot” can be easy and comfortable. Now I understand that the people who initially taught me were caught up in their method of trimming and constantly over-trimmed horses. They trimmed sole and bars aggressively, micromanaging feet, and made excuses for why the horses were so sore. I’ve trimmed professionally for a more than a decade using a conservative trim approach. 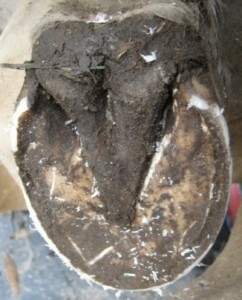 I seldom trim sole and attempt to leave a margin of wall that protects the edge of the hoof and provides traction. As a result horses with healthy feet are very comfortable on their home ground barefoot, and many go barefoot on the trail year round. I look for long relaxed strides at a trot and canter with nice, heel-first landings to assess movement. Some horses have thin or sensitive soles, or inadequate wall, and need protection. Most of the time, horses coming out of shoes are comfortable without protection in their living environment, but if they are sensitive, they get boots or glue on shoes. Most horses with philological problems are comfortable barefoot or booted if the trim is conservative and appropriate protection is used. Most horses can grow a thicker more durable sole with the correct trim and diet, but many still like front boots for performance work for the first year or two. 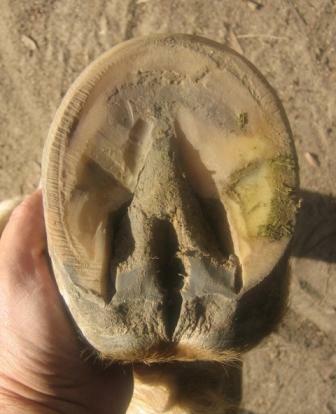 Some horses have limited ability to grow a thick enough sole to be barefoot for performance because of past hoof care, breeding or pathology. 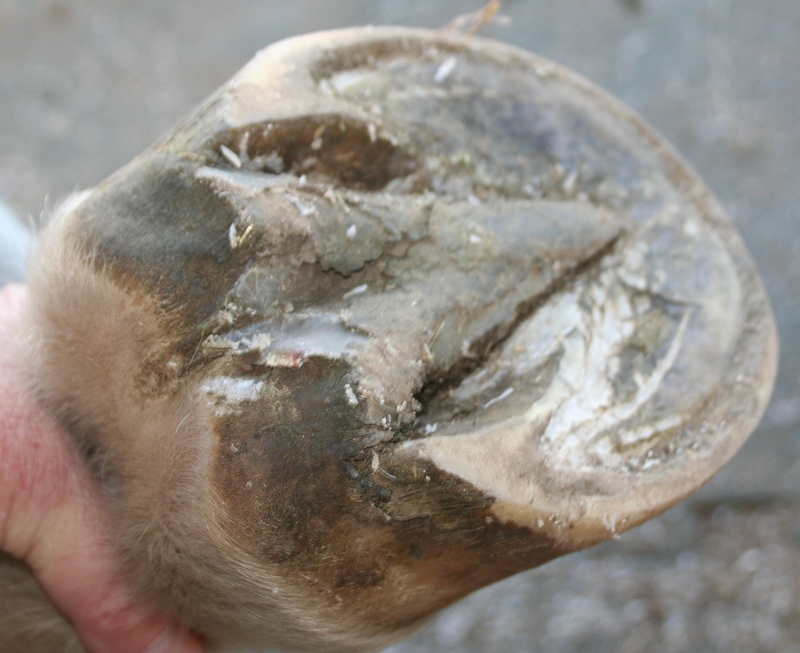 I see many photos of horses online who have either had their soles aggressively thinned by owners with good intentions, or whose walls have been trimmed, chipped or worn so short that the hoof has inadequate traction resulting in soles becoming dangerously thin. These are the horses and owners we need to help. When a horse has a thin sole, it needs hoof protection to move comfortably and rehab successfully. Traditionally, nail on shoes were used, and now we have many alternative ways to protect feet for recreational, performance and rehabbing horses. Synthetic shoes, casting and glue on boots provide a semi-permanent alternative that stays in place for an extended period of time.The primary advantage is that they avoid concussion and flex more than a metal shoe. Boots and pads can be left on for days or weeks, and should be checked daily. Epoxies and sole treatments also help protect feet depending on the condition and terrain. 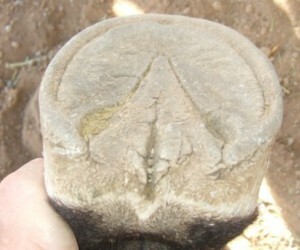 The following pictures are the same hoof taken at different times of the year. This is is a early fall (October) hoof from an Arab on pasture. The summer sole and frog have shed. I live in North/Central California. We have very wet winters that start in October and last through March and April. Winters here are as wet as Washington DC and Virginia, where I grew up. Summers are very dry, with almost no rain but occasional coastal fog… the soil is a mixture that can be lava rock, granite, loam or sand. I rarely have to trim sole in this part of North / Central California. 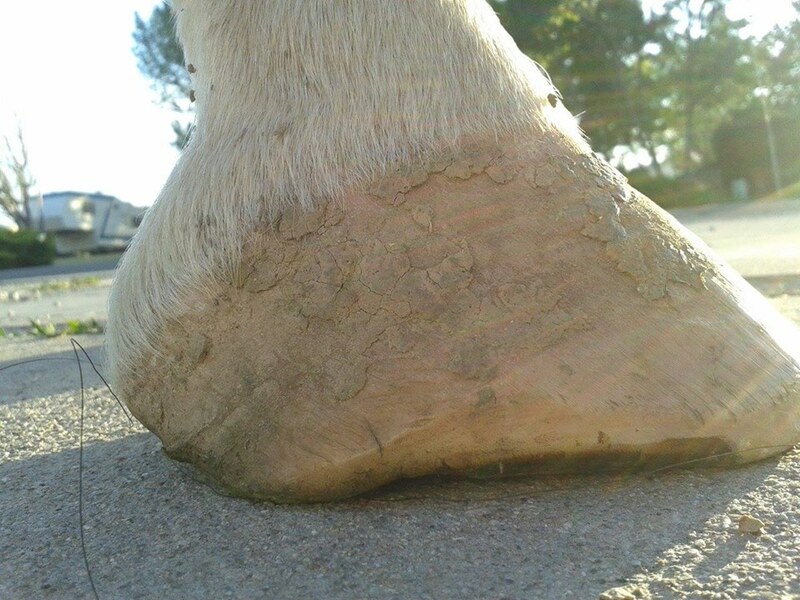 In the summer, a thick sole accumulates and protects the hoof from all of the rock on our trails, and before it can get too thick to create a problem, we have wet weather that encourages the accumulated sole to shed. Some regions are extremely arid and sole builds up in a dense, hard layer that can make horses very tender. Some trimming schools advise removing any sole that isn’t “live”, but where does “live” sole start? What is “false”?? What is a thin sole, and what is normal? And why remove any protection at all? Sole is sole; the term “false sole” is misused and after reading a too many ABC FB shares, I’ve decided to stop using it because it implies that it needs to be removed, and it usually doesn’t unless you live in an extremely arid region like Last Vegas. When Sole accumulates I call it “retained” because, for some reason, the hoof has opted not to shed it. 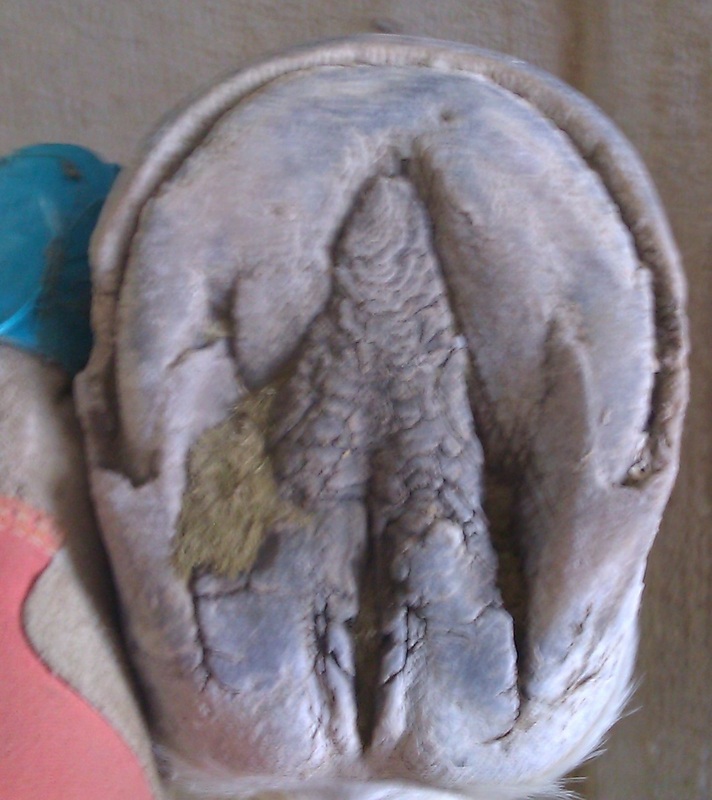 I see sole retention when a horse with hoof pathology first comes out of shoes… sometimes they retain this sole for 3 or 4 months as the hoof rebuilds itself from the inside out. I used to trim it out, and the horse was always more tender and the feet rehabbed slower, and the horse did better in boots. With these feet, I leave the sole in place but sometimes thin it **slightly** with my sole nippers or a sharp knife to add a little passive concavity. I do very little. When it starts popping out, I help it as it pulls free but leave chunks that are resistant in place. 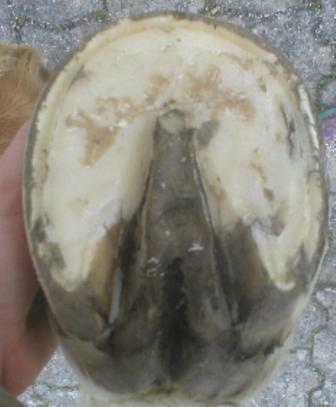 I think these are the hardest feet in the world to trim, physically (super hard sole) and intellectually because its difficult to know how much sole to remove unless you trim this type of hoof a lot. I see them primarily on horses that live on mats, and I have trimmed the retained sole, not trimmed it, relieved the bar slightly, nothing seems to work well! I usually ask people to move their horses or change the stall footing, treat it like I do dietary problems like barns that only feed oat and alfalfa… if its a problem for the horse, I ask the owner to move the horse. Asa, in Las Vegas, doesn’t have this option! Some horses have had chronic thrush and end up with retained sole that seems to grow to isolate the super tender frog from the weight bearing surface and any flexing in the tender frog area. I help the client fix the diet and treat the thrush, and this sheds out in a month or two. 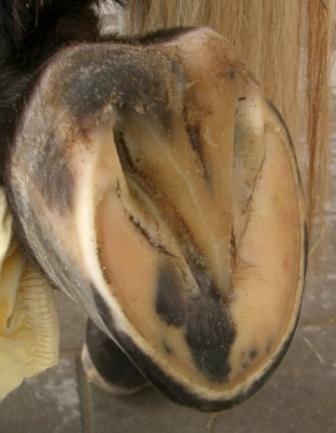 If a horse has a solar abscess that covers the whole sole, the hoof repairs itself and eventually sheds the sole in one large piece. It may look black and gross under the shedding sole, but I’m not in a hurry to wrench it off! I had one horse who only retained sole in the lateral side of one hoof, all the other feet looked great. 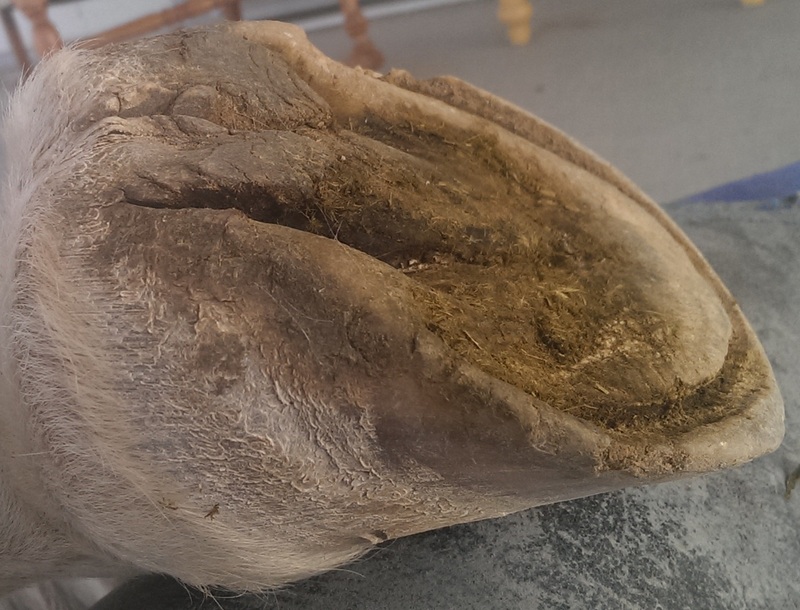 The horse was very slightly off on that foot barely noticeable… after 3 months, the owner insisted that I knife it out, it was rubbery and durable, the horse resisted, but I did as she asked, leaving much of it but adding some concavity, and the horse went lame immediately. Vet xrayed the foot and the lateral edge of P3 had a fracture. 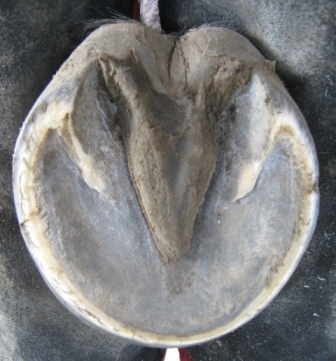 we casted DM (dental impression material) into the sole and the horse was immediately better. She retained sole in that area for a year, it finally shed and the mare was sound. My horses shed sole in moist seasons and accumulate it in dry seasons, and because this isn’t excessively arid like Las Vegas, I leave the accumulated sole alone. If it starts to chip out and is loose, I’ll remove chunks, don’t like to leave pressure points! But I let it shed out naturally until its loose. 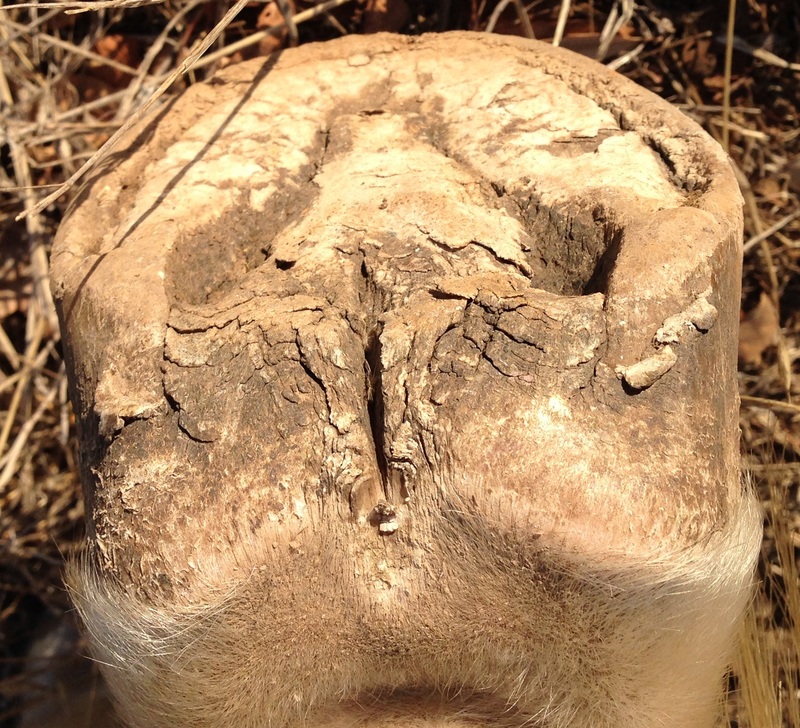 This entry was posted in Boots and Protection, Hoof Health, Trimming. Bookmark the permalink. 2 Responses to Sole… “False” sole, shedding sole, retained sole. When to trim? When to leave it alone?